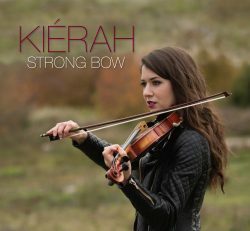 “Strong Bow” is an impressive demonstration of Kiérah’s virtuosity as a fiddler and of her unique style of composition. This powerful album brings traditional and contemporary Celtic fiddle music into the 21st Century. Kiérah is accompanied by outstanding musicians: Adam Dobres (guitar) Adrian Dolan (piano, mandolin, mandola, accordion, viola) Jake Jenne (drums) Robin Layne (percussion) and Paul O’Brien (bodhran). Special Guests: Harold Birston (cello) and Michael McGoldrick (flute). The album showcases 15 of Kierah’s original tunes. Recorded at Blue Frog Studios, White Rock BC. Mastered at Airshow Mastering, Takoma Park, Maryland.